Bryan Lions win hard fought conference battle against Reinhardt Eagles to the delight of the home crowd. 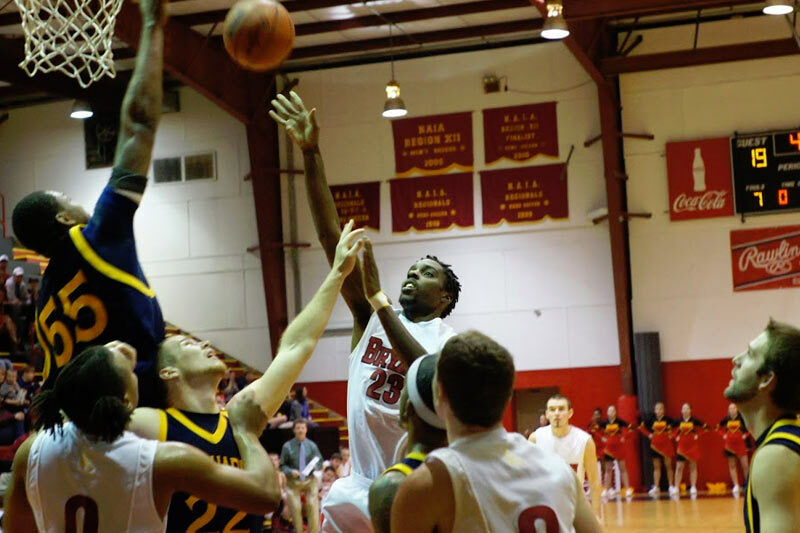 Bryan College Basketball Men’s Team hosted Reinhardt at Summers Gymnasium on Saturday afternoon. Bryan College came into the game with a 12-10 overall record and 7-4 in conference. Reinhardt came in with an 11-10 and 7-3 conference record. Bryan played Reinhardt back on early December and lost 82-81 in a fiercely contested game which Reinhardt won on a last second free throw by Matt Porter. A big stat for that game was 16-39 three point baskets. To this point probably our biggest win of the year. I am pleased with the 10 out of 12 wins but we still feel we have plenty of room for improvement. Caleb Tuck and Brandon Cole got Bryan off to a good start with three point baskets as Bryan took a 12-4 lead with 14:48 left in first half but Reinhardt rallied to cut the deficit to 13-12. Over the next few minutes Bryan went on a 27-4 run to take a 30-16 lead with 6 minutes left in the half. When Logan Sharp made a three pointer at the 2:45 mark, Bryan enjoyed a 43-21 lead. Reinhardt cut into the lead a little over the last 2 minutes to cut the score to 45-27 at the half. Over the next 10 minutes the teams exchanged leads and there were six ties along the way and neither team led by more than three points. Reinhardt made a basket with 2:20 to tie the game at 67-67. Robert Troino gave the Lions the lead 70-67 with a basket and the free throw. The Eagles fought back and came within one point when Reinhardt made a free throw with 52 seconds remaining and made another free throw with 12 seconds to tie the game 72-72. After Bryan had two free throw misses it was Derrick Walker with the big rebound and putback with 4 seconds left to give Bryan a 74-72 lead that stood up till the buzzer. Derrick Walker only had one basket but it was a big one. Robert Troino and Brandon Cole led the way with 24 and 22 points for the Lions and Derrick Walker had the one big basket and 11 rebounds for Bryan and Brandon Cole pulled down 15 rebounds. Coach Don Rekoske joined the 300 Win Club with the game marking his 300th career coaching win. Congratulations Coach! !